Obtain increased wheel travel for the 2005-17 Toyota Tacoma with a mild lift height. These heavy duty Upper Control Arms feature 1.25” OD, .120” wall thick chromoly tube construction with 1” diameter Stainless Steel Uniballs that attach to the factory spindle without drilling. 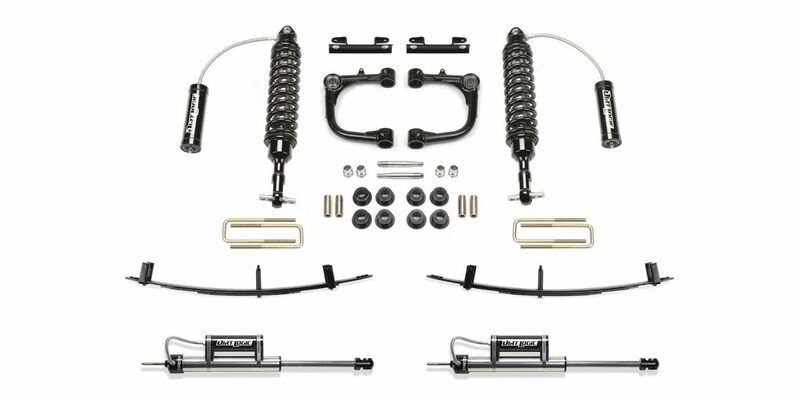 The replacement UCA’s have been designed to work in conjunction with Fabtech’s Dirt Logic 2.5 Coilover shocks providing 10” of wheel travel for a complete front suspension system upgrade. A rear three leaf spring pack enhances the factory leaf springs by eliminating the stiff lower overload leaf. This allows for more flexibility and travel while enhancing the ride quality. Front stainless steel Dirt Logic 2.5 Coilovers with cold wound coil springs provide 10” of wheel travel for aggressive offroad use. The rear Dirt Logic 2.25 shocks will also provide 10” of travel due the remote reservoir allowing for the full stroke of the shock.